Although not necessary, an air pump can make a huge difference for your entire aquarium. New aquarium enthusiasts should take an interest in this affordable and beneficial accessory. To keep your water properly oxygenated and help your fish thrive in their environment this is a “one-stop-shop” accessory. It keeps your water from sitting stagnant and can help build your water columns giving your water flow a direction. Why Use an Aquarium Air Pump? By moving air throughout the water you create a circulation within your tank. This means that your fish aren’t moving through stagnant and low-oxygen water. Instead, they’re provided a rather comfy existence. This semi-vital addition to your aquarium doesn’t determine which fish of yours will live or die. The myth that air pumps are completely necessary has long been debunked. However, the effect it has on circulation and creating a waterfowl can’t be argued as anything but beneficial. It helps your filter release excess carbon dioxide in your aquarium through this increased circulation. Finally, some filters that you may have already researched require an air pump. Protein skimmers are also known to rely on air pumps. These air pumps use the force of the air passing from one area to another to power the attached device. It can also serve decorative purposes affecting a number of additions that spin, lift, or turn. If you’re looking to increase the efficiency of your filter you can check out the common pairing of an air pump and air stones. As we mentioned above, an air pump can be used to power another accessory. Air stones deliver tiny bubbles which break up the water before it hits the filter. More effective filtering means less time cleaning and a cleaner tank! These three elements come together for not only your tanks aeration but also for your comfort. A sound level doesn’t sound like a top priority. Until it’s the middle of the night and the aquarium, rooms away, is the loudest thing in the house! Trust us, you don’t need a quiet filter but you will want one. There are four types of air pumps and they all serve different purposes. They are sorted by how they operate and what features they provide. 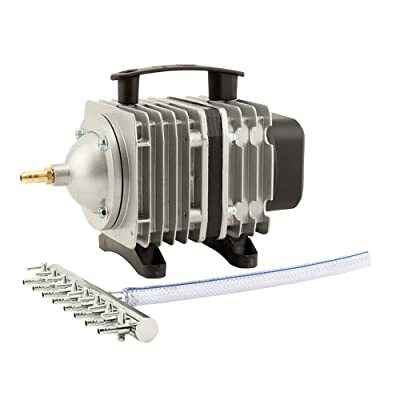 The most common air pump option, these are your “plug-and-play” style pumps. In other words, you plug them into the wall, and they work. Some operate on battery packs which are slightly more portable, but aquarium enthusiasts usually aren’t overly concerned with portability. If you find a traditional plug-in air pump with a battery pack this is a great combination of value and a go-to method to ensure your tank is least affected by a power outage. That’s right; air pumps power many accessories throughout your tank. However, many aquarium enthusiasts use air pumps to power one non-negotiable aspect of their tank… their under-gravel filter. If you’re using an under-gravel filter you may already be familiar with air pumps. Choosing the right size for these air pumps is made easy as they are marketed by the size of the aquarium they suit best. If you have a particularly deep aquarium, you will need an air pump designed for deepwater. Using a standard air pump in a deep tank can cause uneven distribution of the air bubbles and affect the overall health of your tank. Although not having an air pump is optional, misusing one can cause serious issues to your environment. Deepwater air pumps advertise specifically that they can handle depths of 18 to 20 inches or even more. Deepwater compatible, offering air pumped down to 8 feet. The deepwater application here is hands down unbeatable. Submerging air consistently down through eight feet of water is something that many deepwater air pumps can’t do. Intense back pressure, which is what enables it to pump air so deep into a tank, is useful for many other purposes as well. 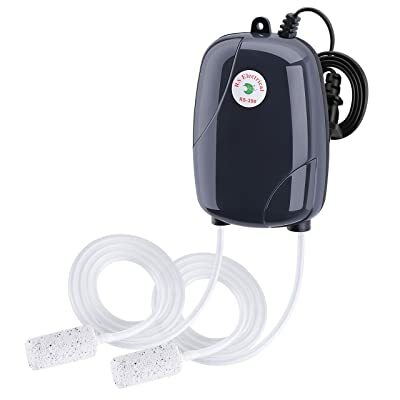 If you’re using multiple air stones or multiple air pump powered decorations you can use this pump without losing power. If this is in your budget and you have a large tank, the Tetra is a top pick. However, if you have a 50-gallon tank you would definitely want to step down in size from what we looked at here. The unit is designed to operate quietly by distributing its vibration throughout four rubber, suction-cupped feet. This means that it sends excess vibrations from its motor down through rubber and then evenly disperses it over the surface area it covers. Another top name known throughout the aquarium enthusiast community, Fluval delivers another high-quality product. The best feature here is the swing-arm and diaphragm design. That sounds really complicated, but in reality, it’s very simple. What the swing arm does is monitor its own distribution of air pump power. It delivers aeration evenly to provide equal carbon dioxide dissolution. This pump is a great option for beginners. It is powerful, but it quickly loses this power as more air stones, or valves are used. If you’re using this to power air dependent decorations, expect to lose power quickly. Durable by design with high-quality external materials. This pump delivers most of durability. If you have an open tank setup or know that there is a risk the actual unit will take some heavy battery, this is an option that should last through the years. Built with chrome exterior and durable components EcoPlus didn’t skimp on quality. This pump has short-comings in two areas: noise and price. For being one of the more expensive air pumps it should also be quiet. If you’re looking for a lot of power in a large aquarium and noise isn’t a problem, this air pump could last you for years. This filter is an up and comer. The feedback from users is great and the durability ensures it will be around for a quite a bit longer than other air pumps in this price range. The universal size is usually a downfall; however, with having multiple options on how many outlets it has redeems this quality. Instead, you know this pump is delivering peak performance all the time as the power is regulated first before the outlets are assigned out. 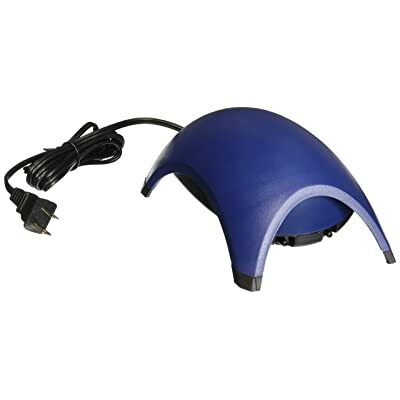 With a type of artificial rubber, the Active Aqua Air Pump maintains stability in its air flow and pressure. It’s adjustable and very quiet. This is everything you could look for in a pump, regardless of the price. However, keep in mind the pump itself is not waterproof so it is prone to damage from spills! It also doesn’t have a power switch which has become a staple in air pumps. Instead, if it’s plugged in, it’s on. The best feature here is that it’s a complete kit. The air pump itself is of high-quality although VicTsing isn’t a well-known name. It comes with everything you could need to start aerating your aquarium right out of the box. This is definitely recommended for beginners or someone just starting up a new aquarium. The pump itself is near silent and delivers adequate power for up to a 50-gallon tank. The air stones are ready to use to help direct water flow. 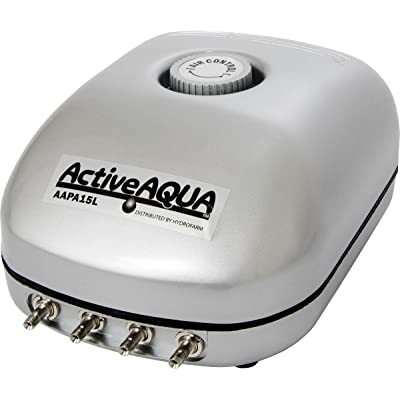 It increases water flow and aeration which is all about the overall health of your aquarium. 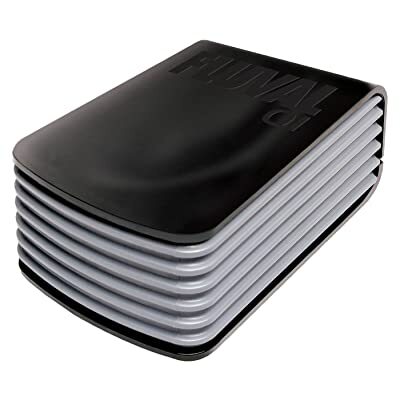 The top pick for best air pump is the Fluval Q1. It brings in long-lasting, high-quality performance for large aquariums. The Fluval is also capable of maintaining high-demands with up to eight air stones without losing significant amounts of power. In terms of noise level, power, and versatility in size the Fluval Q2 Air Pump is a great value, and at a great price. To really top it off, the pump has a two-year manufacturers warranty for normal use. If anything happens, contact the manufacturer to find out what your next step is.